We are pleased to announce that the lawsuit against an number of Jewish organizations including HDC for conducting our kapparot tradition has been dismissed by the court. We do however anticipate an appeal by the plaintiff which we are eager to fight. HDC proudly will hold Kapparot tradition this year as well. We are not intimidated nor will we allow twisted minded and misguided activists take away our religious freedom. There will be LAPD presence to ensure everyone's safety should there be any disturbance by protesters. Come out and defend yourself, your nation, and your religion. I'm writing to you with a heavy heart. We live in a hypocritical era where people who call themselves liberals, are the ones taking away liberty from others through distorted definitions of right and wrong. 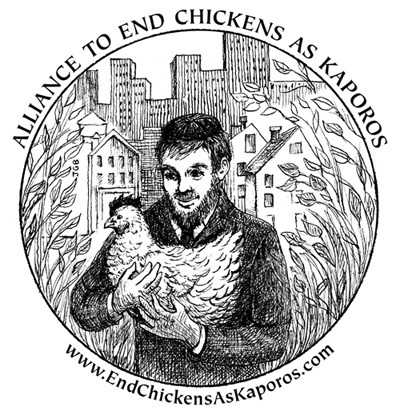 There is a Jewish ritual of slaughtering a chicken (Kapparot) between the days of Rosh Hashanah and Yom Kippur as an atonement for one's sins. Although at first glance, it may seem like an uncivil and medieval custom, in the eyes of animal activists, but indeed there is much meaning and depth behind this ritual. The rabbi's explain to us that a person needs to repent during these 10 days. Part of the process of repentance is to regret one's action. The concept of sacrifices in the times of the temple or the kapparot in our times, is to visualize the severity of punishment thus cause the sinner to regret his/her wrong actions. Part of the procedure of bringing a sacrifice, repeatedly mention ed in the Torah (i.e. Leviticus 8:14) is to place one's hands upon the animal and lean over it while reciting that this animal should be slaughtered instead of the sinner. At that moment, the one who offers the sacrifice should visualize that whatever is happening to this animal should have really happened to him. By seeing the blood of this animal spilled, he will feel regretful for his actions and change his ways. Of course , this is done with ut most compassion and least suffering possible to the animal or bird as the Torah command us to do so. The Torah requires us to do sacrifices since all that is created by Almighty in this world is just to serve man, including all creatures and animals. Since man, who was given a soul, is the only being that the purpose of creation can be achieved through. All else is there to assist and accommodate that him. Therefor it is justified to kill an animal in order to bring man closer to his mission. However, in a world that there is no G-d, rightfully so, there is no difference between different creations. They were all created equally by chance. One might be more capable than the other, but that doesn't give him more privilege and right than the other. Therefore, the life of a bird is no less important than the life of a human. 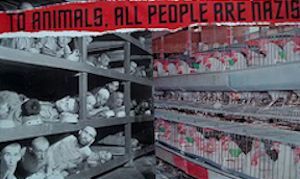 With such warped ideas, these people place stickers on their cars stating "I do not eat other animals", thus implying that they themselves are animals, and will go as far as placing ads showing pictures of the holocaust prisoners being equivocated to chickens in their cages. This is the direct result of a G-dless world. At this point , this issue is not a mere disagreement of ideas, but rather the imposition of one side's ideas to the point that it takes away the other side's liberty of practicing one's Constitutional Freedom of religion. It is about taking away the first amendment right which this country was founded upon. Sadly enough, majority of these actions are sprouting from anti-Semitic roots. This is the same path that leads this great country to what's taking place in Europe. Where in certain countries, the Jewish slaughter of any animal under any circumstances , is prohibited. The next case brought up is the thousands of years tradition of circumcision being banned. If we do not stand up and protect our right in this second largest Jewish community outside of Israel, these twisted minded and misguided activists will not stop short of imposing their views on many aspects of our lives. Although the law in this great country allows us to do ritual sacrifices, a lawsuit, filled with lies and deception, was filed against a few Jewish organizations in Los Angeles, including us, for practicing the kapparot ritual. Using lies and deception is commonly used by these activists in achieving their goals . We will stand strong to protect our first amendment right and uphold our freedom of religion while exposing the deceitful tactics and measures of such activists who wish to impose their baseless views on society at large. IN RESPONSE TO THIS LAWSUIT, WE DECLARE THAT WE WILL CONDUCT OUR KAPPAROT RITUAL THIS YEAR STRONGER THAN ANY OTHER YEAR. I strongly encourage every member of our Jewish community to support and protect o ur religious freedom by participating in kapparot this year, more than ever. In order to protect the community members from the harassments of these activists, we will do the kapparot at an anonymous location. 3. Stop by one of our offices.